The photograph shown is of the foreshore at the site of the Castles Shipbreaking Yard located at Charlton on the River Thames. The wood has been identified as belonging to two sailing ships and one metal ship broken up by Castles being HMS Duke of Wellington, HMS Hannibal and HMS Ajax. 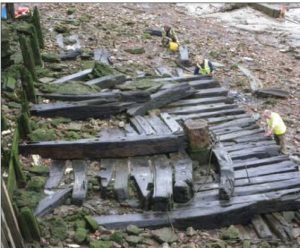 The excavations were undertaken by the University College of London, whose students performed most of this exciting and historical work on a narrow tidal foreshore. In addition it provides testimony to the long lasting qualities of teak and metal taken from these historical ships of the line.